Of course, it’s a form of online advertising through banners. 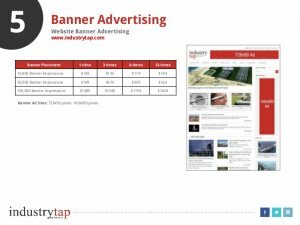 Banner advertising is also called display advertising (as opposed to text-only advertising) because of the visual nature of banner ads. A banner ad, or a web banner, is an advertisement displayed into a web page. The advertisement consists of an image (.jpg.png.gif) or of a multimedia object (usually created using Flash). Thus, banner ads can be static or animated, depending on the technology used to make them. Banner ads are intended to generate traffic to a website by linking to it. Also, web banners can function as regular, print advertisements: inform, notify about a new product, increase brand awareness and so on. However, most of banners are clickable and their main function is to get clicked on. But we’ll talk about banner effectiveness in a few moments. Generally, banner ads are placed in high traffic websites that offer interesting or useful content. But, besides the traffic, there are other important aspects to be taken into consideration when choosing a website to advertise on. One of these aspects is the website’s target, which has to more or less match with the banner’s intended audience. One advantage of the online advertising over the traditional one is that its effectiveness can be easily measured. Regarding banner ads, the main effectiveness indicator is the click-through rate. The click-through rate (CTR) is calculated by dividing the number of users who clicked on the ad by the number of times the ad was displayed (impressions). For instance, one might say that a certain ad has a click-through rate of 3%. That means that out of 100 impressions delivered, the banner was clicked on three times. Therefore, the higher the CTR is, the more effective the advertisement is. It’s that simple. When you browse across the Internet it’s likely for you to encounter all kind of banners in all kind of sizes. Lucky us, there are some standards too. And their role is to reduce the amount of work for agencies when faced with the problem of creating many banners and similar sizes for different publishers. And here is where the IAB standards come into play. But we’ll talk more about ad standards in a future post. How do I make a banner ad? Easily! You can create static or animated banner ads with BannerSnack, without any coding skills. The best part is that anybody can create banners: all you need is a computer with internet connection. You can log in with Facebook, Twitter or your email. If you need an example, watch a YouTube video. How do I advertise my banner? After you create the banner, you need some web space to use it, so you will need to buy ad space on websites. Contacting blog and website owners and negociating with them individually can be stressful and time consuming, so most people choose an advertising network to help them distribute their ads. Some of these advertising networks are: Google Adwords, iab., Aol Advertising, Right Media, BuyAds.com, OpenX. Each one of these has certain standards, so you should make sure that your banners comply with their regulations, before you start creating the ads. This way, you won’t have to edit the banner again. BannerSnack banners are compatible with all of these ad networks.